Joe Butler started fishing at an early age and was intrigued and fascinated with the pursuit of big fish. He has gathered knowledge over the past years from many great fly fishers and today shares that knowlege with anyone that wants to learn. Joe has spoken at hundreds of seminars, clinics, programs, trips and organizations such as Trout Unlimited and the Federation of Fly Fishers. 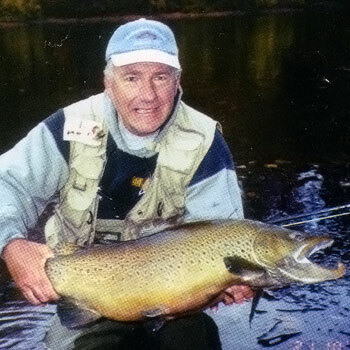 Joe is well known for catching big, big brown trout. He's guided many fly fishers over the years to the Lake Ontario and Lake Erie tributaries to catch these awesome fish. What many don't know is that during the fall spawning run of brown's you can also fly fish for king salmon and steelhead. Join Joe and find out his secrets about fly fishing for these coveted trophies. Joe has made the hunt for trophy fish a passion. He held the world record for a brown trout on a fly rod for 20 years - a 27 lbs. 3 oz monster. He also holds the world record for a kokanee salmon on a fly and is in the Fly Fishing Hall of Fame. He has written six books on fishing including "Big Trout on Flies". If you want to learn how to find, catch and land huge fish you'll want to hear what Joe Butler has to say or, better yet, join him on one of his hosted trips to catch trophy fish. Joe has hosted trips all over the United States for the past 20 years so you know you'll be working with a seasoned professional. Joe Butler has been written up in over a hundred newswpaper and magazine articles over the years and continues to receive national acclaim - truly a world-class fly fisher. For more information on Joe's hosted trips and books visit his web site at www.ButlerFishing.com.